This novel variety is actually an Italian Heirloom. 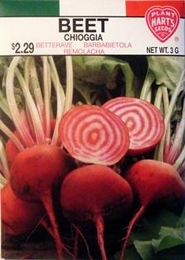 Also known as candy stripe beet or bulls-eye beet, the round roots are 3 inches in diameter and produce alternating red and white concentric rings when sliced. Retains marking if baked whole and sliced immediately before serving. Young Chioggia beet tops make excellent greens either cooked or fresh which are used like Swiss Chard and can be grown all summer. Matures in - 60 days.